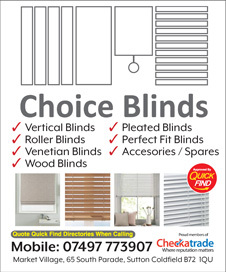 Choice Blinds in Sutton Coldfield are Quick Find Directories vetted and recommended local business offering a wide range of fully customised and reliable window coverings and blinds. Covering Sutton Coldfield, Four Oaks, Boldmere, Wylde Green, Warmley Ash, Mere Green and Little Aston. "Mario is extremely passionate and professional about his work. All my blinds were supplied and fitted and are of a very high standard. Mario’s prices are very competitive and it is well worth having a quote from Choice Blinds before going anywhere else, saving us a considerable amount of money. I will certainly use and recommend Choice Blinds in the future. A big thank you, Mario.”"
"“Mario came to fit vertical blinds in my living room. If I could give 100 stars then I would! He has done an amazing and truly professional job - he is brilliant at what he does. The blinds we’re just how I wanted them! Not only is he an expert in what he does, he’s friendly, chatty and very professional. Would defiantly recommend and will be using choice blinds again! Thank you so much!”"
"I had three vertical blinds fitted to a grade II listed building, they were huge in length, the windows difficult and sash windows too Mario was careful, polite and tidy All wrapping etc taken from site too Can highly recommend Choice blinds for quality and price"